One of the passions of Inca emperors was to wear dresses of finest fabrics. Emperor, his family and Nobles wore clothes of highest quality. 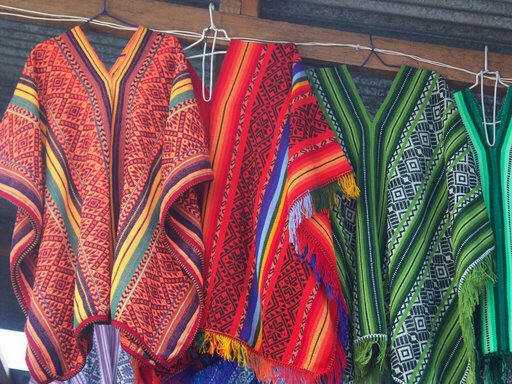 You can not buy clothes those Inca emperor wore from present Peru, but in Peru still people wear tunic, ponchos and other colorful dresses as they did on those old days. Probably you are already advised to buy garments made from Alpaca or Vicuna. Sweaters made from Vicuna or baby Alpaca are really good. Also you can buy Peruvian Ponchos, hats and socks. Vicuna sweaters are really expensive but they are really good looking, very very comfortable and they stay forever..
Where to shop for clothing..
You can buy Alpaca clothing from any big cities, or from the roads stalls. In lot of cases they will say,' My grandmother made it on her deathbed, hand made', or you will hear, ' Made form original baby Alpaca'. But if you see the price is less than $50.00, it is certainly not Alpaca. One more thing, Baby Alpaca doesn't mean the young Alpaca or child Alpaca, here baby Alpaca means the first wool of Alpaca, which is really very soft. Don't worry much about whether it is hand made or factory made, actually experts always say Factory made sweaters are better than hand made ones. Lot of people may refer you to go Pisac market. 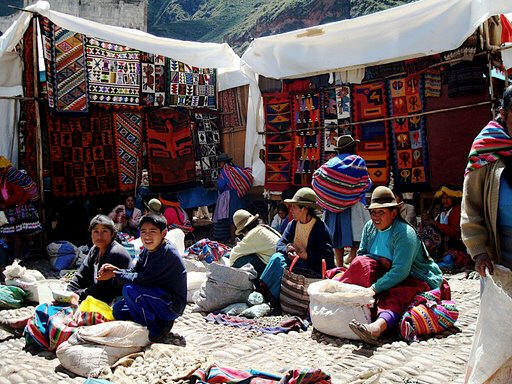 It is not that you can get something there which is unavailable in Cusco or Lima, but it is the environment of the market which attracts people. You will like the market, I can say that with certainty even if you are the kind of people who does not like shopping. But don't expect to get things cheap there. They say occasionally they sell cheap in Pisac market. But those occasions ( if exists at all) are so rare, you can not will never hit that while you are in Pisac. If you want to buy something with Inca or Machu Picchu logo, you can buy from cafepress.com/incalogo website, before you leave for Peru. Look at the tea shirt below, It is cute. This type of tea shirts are around $20.00. Alpaca111 is a famous chain in Peru. You will get certainly high quality Alpaca garments here.They have stores in Lima, Cusco, Arequipa and Puno. Alpaca 111 is more famous may be because they are one of the few stores where you can get Vicuna staff also. Vicuna is much more expensive than Alpaca and known as the finest wool throughout the world. Mercaderes street 141, Int. A-1, Downtown. Plaza Bolivar - Selva Alegre. Av. Bolivar 1515, Pueblo Libre. Pisac is a two hour journey by bus from Cusco. The market in Pisac is open three days a week, Tuesday....... and Sunday. Since is the busiest day here. This market is touristy and colorful. You can get everything in a single location here. In the street stalls they sell Alpaca sweaters, which are always made of baby Alpaca. But in almost all cases they are not baby Alpaca, even not Alpaca. Mostly they are made of Polyesters or acrylic. Alpaca sweaters should cost you at least 40/50 $. If you bargain with the price and be able to bring the cost down to as low as 20/25 $, then it is not Alpaca.